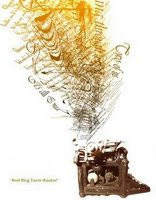 Lesa's Book Critiques: Sunday Salon - Blog Awards! 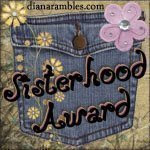 And, Yvonne at Socrates' Book Reviews presented me with the Sisterhood Award. I understand these awards are all supposed to be passed on. I also know that each award asks the recipient to nominate ten more people. 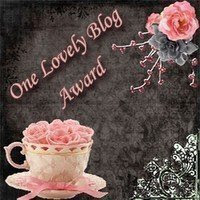 I'm going to accept the awards graciously, and just ask that you read some of the blogs on my blog list. I wouldn't be following them if they weren't good blogs. So, I nominate everyone I follow because they have interesting blogs. Enjoy them! Oh, and we've known each other for almost 5 years. It was in 2004 that I became an ARMie! Thank you, Kathrin. It felt longer than 3 or 4 years, but I couldn't remember when you joined ARM. Once people join and participate for a while, it seems as if we've been friends forever! Thank you, Blodewedd. It was such an honor to receive all of them. Oh yes, Lesa :-) It sure seems like that. I actually consider you family! Me, too, Kathrin. It's nice to have a niece in Germany! Congratulations on the awards, Lesa! They are definitely well deserved!